A black and white negative of a group of unidentified people socializing at an outdoor church party in Whitby, Ontario on June 20, 1938. Some of the women are wearing hats and the men are wearing suits. 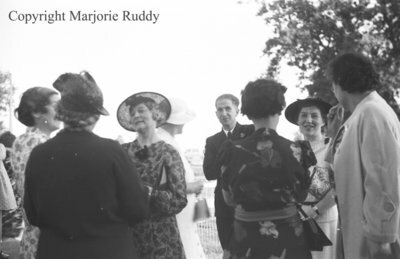 Church Party, June 20, 1938, Marjorie Ruddy. Whitby Archives A2013_040_942A.